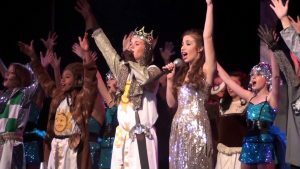 Monty Python’s Spamalot Young@Part® is the authorized 65-70 minute edition of the Broadway musical for elementary and middle schools, and youth theatres. 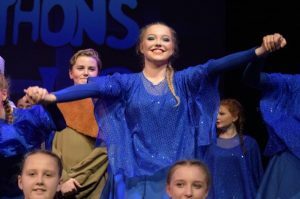 Through a series of workshops with industry professionals and actual kids, the Young@Part® musicals are tailor-made for younger actors. Song keys are changed where needed, songs and scenes are edited for time and content, while keeping the spirit of the original Broadway show intact. There are great parts for girls, boys and can feature any size ensemble/chorus, who are featured throughout the show. The story centers around King Arthur and his search for the Holy Grail. After a rather silly bit of miscommunication leads us briefly to Finland, our king and his ever faithful squire Patsy begin to search for knights to accompany him on his Quest. He finds his first in the unlikely guise of Dennis, a hideous local mud farmer. After convincing the locals that he is the king by conjuring the Lady of Lake to prove it, Dennis is transformed into Sir Galahad. The rest of the knights are found far and wide and The Lady of the Lake and her Laker Girls, send our stalwart band on their way. 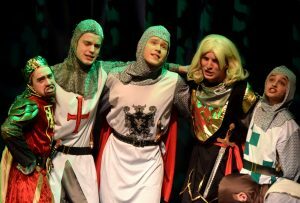 They meet up with an unforgettable slew of outrageously kooky characters and musical hilarity ensues as Arthur and the Knights make their journey. SIR ROBIN (30s-40s): A Knight of the Roundtable. Ironically called ‘Sir Robin the Brave,’ though he couldn’t be more cowardly. Joins the Knights for the singing and dancing. SIR LANCELOT d/b/a LANCE (30s-40): A Knight of the Roundtable. He is fearless to a bloody fault, but through a twist of fate, does discover his ‘softer side. PATSY (30s-40s): King Arthur’s horse and servant. Underappreciated but always longing for King Arthur’s approval. Good, funny, physical mover with some tap dancing. SIR GALAHAD (30s): A Knight of the Roundtable. Begins as Dennis, a lower class ‘mud gatherer’ who becomes knighted and transforms into the dashing Sir Galahad. Strong bari/tenor singing required. SIR BEDEVERE (20s-40s): A Knight of the Roundtable. An inept scholar. No solo singing. THE LADY OF THE LAKE (20s-30s): A Diva. Strong, beautiful, possesses mystical powers. The leading lady of the show. Great singing voice is essential, as she must be able to sing effortlessly in many styles and vocal registers. HISTORIANS (3): Tweedy academics. Must have excellent diction. DENNIS GALAHAD’S MOTHER: a shrill peasant woman (often played by a large male actor as an homage to the original Python sketches. TIM THE ENCHANTER: a ghostly being with a Scottish accent.